It's a little-known fact that I used to be a movie critic in the early 80's. You see, I've had a lifelong obsession with movies. In fact, I studied filmmaking in university, worked in the feature film industry for many years, and still watch several movies every week. As many readers of my blog know, I also have a thing for domain names, so I guess it was inevitable that I would find a way to combine two of my favourite obsessions. 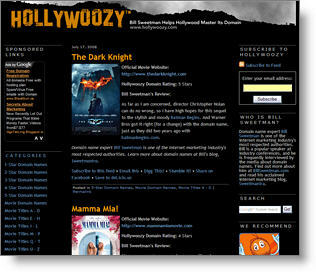 Today, I am thrilled to unveil my latest creation, Hollywoozy (www.hollywoozy.com), the first Website devoted to reviewing movie domain names. That's right, I'm critiquing the domain names used to market movies. I don't know about you, but over the last five years I started to notice that just about every movie trailer (another obsession of mine, by the way) ended with the display of the official movie Website's address. Many times, the domain name that would be featured in the trailer and other marketing collateral for the movie was laughably bad, at least to my marketer's eye. At first, I found this amusing. Then it became something of a game for me and my wife, as we would patiently wait for the end of the trailer to see how good, or bad, the URL would be. I soon discovered that I wasn't the only one puzzled by the domain name choices the movie marketers made. A number of my Internet marketing colleagues were equally amused by what appeared to be Hollywood's inability to grasp the importance of having a good domain name when trying to market a multi-million dollar movie. After all, the producers and studios decide years in advance what the title of the movie will be, so there's no excuse for not researching (and securing) the availability of the appropriate movie domain name ahead of time. Yes, even if that - heaven forbid - means buying the domain name from someone who already owns it. If you're spending tens of millions of dollars marketing a movie, spending $10,000 to get the best domain name for the movie is well worth it. While all of this was rattling around in my head, I was also itching to find a way to return somehow to my film roots. At first I thought I'd start reviewing movies again, perhaps for a publication or Website, but then I realized that the Internet is awash with movie review Websites and blogs, and besides, I had already been there, done that. Then it hit me ... what about a Website where I reviewed movie domain names? And that's how Hollywoozy was born, although it took me months to come up with the right name for the thing. Naming, yet another one of my obsessions! Unlike my other online ventures (see sidebar), Hollywoozy is a little less serious, although at its core it is meant to be educational. Hollywoozy also gives me a chance to roll up my sleeves and try my hand at some new (and not so new) Internet marketing techniques. In the coming months, I will be sharing excerpts from my Hollywoozy "Marketing Diary" with you so that you can learn about the techniques I am using to promote the Website and, perhaps more importantly, find out what works and what doesn't. Before I wrap up, I'd like to thank the gang at Mouth Media for creating the official Hollywoozy logo. They helped turn my crazy idea into a reality. I love it when I stumble across a great Internet marketing case study as I am just going about my day-to-day life. A few weeks ago, my wife and I took a quick day trip to Buffalo, New York. At one point during the day, we needed to call for a local taxi, so my wife whipped out her mobile phone and began dialing. I was puzzled as to how she happened to have the number of a Buffalo taxi company at her fingertips. So I asked her about this. As it turns out, my wife - who is the more practical one in the family - knew that we'd need the services of a local cab company while we were in Buffalo, so prior to our trip she had turned to our mutual friend, Google, for help. I was intrigued by all of this, so I asked my wife how and why she chose this particular taxi company. She explained to me that the number one thing that got her attention was the fact that the company had "the best Website address." She went on to explain that, based on the fact that this company was using buffalotaxicab.com as their domain, she figured they were "legitimate" and "had their act together." My wife is right, of course. buffalotaxicab.com is a terrific generic domain name that not only clearly explains what the company has to offer, it is intuitive from a type-in perspective, and it is also loaded with the keywords that are ideal for high search engine ranking. The thing I found most interesting was that the clever company that owned this domain name consists of just two guys with two cabs. But by having this great generic domain name, two guys with two cabs beat out dozens of larger competitors for my wife's business. Way to go, guys. And thanks for planning ahead, honey. I will be speaking at MagNet - Canada's Magazine Conference, June 4-6, 2008 in Toronto, Canada. MagNet is the Canadian magazine industry's big trade conference, and this will be my first time speaking at this event. I will be giving a talk on Search Engine Advertising on June 4 entitled "Search Engine Advertising: The Ultimate Measurable Marketing Tool?" My talk will provide actionable insights into the measurable marketing potential of search advertising and explore why it may be the ultimate direct-response vehicle. For more information about the conference, visit the official MagNet Website. As loyal readers of this blog will know, last month I was in Miami, Florida to attend the biggest domain name industry event of them all, TRAFFIC. While I was there, I recorded interviews with several of the domain name industry's major players. Upon my return, I turned these interviews into six special "road trip" versions of my Marketing Martini podcast, four of which have been released so far. What's a live domain name auction? Find out from the man who runs the top one in the world. In Episode #29 of Marketing Martini, I talked with Monte Cahn, Founder and CEO of Moniker.com, about the world's largest live domain name auction. It was only after the interview that I realized Monte also hosts his own podcast, Domain Masters. Such a small world! Ever looked up the perfect domain name for your business only to discover it wasn't available to register? Don't give up hope just yet; a good domain could still be within reach. In Episode #31 of Marketing Martini, I chatted with Peter Lamson of NameMedia about the "aftermarket" for domain names. In a stroke of accidental marketing brilliance on my part, this episode was released shortly after NameMedia filed to go public. Did you know that buying a domain name is no longer the only way you can gain use of it? In Episode #32 of Marketing Martini, I spoke with Jonathan Boswell of LeaseThis.com about the notion of domain name leasing. Jonathan was such an interesting interview subject that he inspired two episodes. I have received such amazing feedback from listeners about this special "road trip" series of interviews that I wanted to bring the series to your attention. Enjoy! Yes, the rumours are true; I've left MacLaren MRM and will be starting a new job in a few weeks. I can't reveal the details of the new gig yet. As a loyal reader of this blog, however, you'll be one of the first to hear the news. Meanwhile, I wanted to let you know about one of the projects I'm most proud to have worked on during my time at MacLaren MRM. It's a podcast series called Aesthetic Intent and it's for the Buick division of General Motors of Canada. Aesthetic Intent quietly launched during my final week at the agency, and to the best of my knowledge is the first ever podcast by a Canadian automotive manufacturer. Even more noteworthy, in my opinion, is that this podcast is NOT about cars. Aesthetic Intent is a six-part podcast series that "deconstructs the connection between passion and beauty" and features interviews with an eclectic group of people. Each episode is smart, engaging, and authentic ... as well as "inspired by the new Buick Enclave." It's not an infomercial for the vehicle, and the only quasi-advertising content appears discretely in the last few moments of each podcast episode. Kudos to General Motors of Canada for continuing to be an innovator in the Internet marketing space. Yes, I said "innovator." There are very few 'traditional' Canadian companies that have invested as heavily in the Internet channel, and launching this podcast is just another example of GM Canada's enthusiasm for the medium. Regardless of whether or not Aesthetic Intent turns out to be successful, you've got to give GM Canada credit for trying new things. I'll miss working with them for this reason. I also want to tip my hat to the great team at MacLaren MRM that I worked with on this project. It was quite an adventure getting this unconventional project off the ground, however I am confident that all the time and effort will pay off. Check out Aesthetic Intent and let me know what you think. And if you like it, subscribe to the podcast in iTunes. With all the hype about Facebook in the media these days, some people may be inclined to dismiss it as the flavour of the month. That would be a mistake. I think we, as marketers and consumers, have barely scratched the surface of what Facebook is capable of. Here's just one example of another Facebook marketing experiment I conducted a few weeks ago. My friend Jane was trying to rent her beautiful coach house in Toronto's Cabbagetown district. She placed an ad on Craigslist and sent around an email message to her friends, but she didn't get too many nibbles. So I offered to help. Using Facebook's status line feature (which tells your friends what you are up to), I told my network of Facebook friends, "Bill is looking for someone to rent a friend's Cabbagetown coach house." I did this for about a week, and I updated the status line several times during the course of the week. I was pleasantly surprised to receive five different inquiries from friends who were interested in the coach house. That may not sound like a big number, but when you consider the fact I 'only' had about 250 Facebook friends at the time, that's a 2 percent response rate. How many Internet marketing campaigns these days do you know that get a 2 percent response rate? Not to mention the fact the cost was zero. Now I'm not for one second suggesting you run out and start pitching products and services using your Facebook status line. In fact, I am discouraging that. What I am suggesting is that you think about the fact that thanks to Facebook, my little experiment found five additional potential coach house renters for my friend that she otherwise would never have known about. In less than a week. For free. And that, dear reader, is why Facebook's potential is huge. The coach house has now been rented. The Search Engine Strategies Toronto conference was held in Toronto, Canada on June 12-13, 2007 at the Metro Toronto Convention Centre. As always, it was a tightly-run event that was jam-packed with valuable information. In the battle between SEO tricksters and search engines, "the search engines are really winning" because they are becoming much better at determining relevance. "Search engine advertising is a classic example of permission marketing." Brands matter: using a brand name as a keyword (e.g., "Sears") will have no influence on traffic, but will increase the conversion rate and significantly increase the revenue per visitor. Perfecting your search engine ads is important; doing so can have a 36% increase in overall lift. Even national advertisers should consider regional targeting and campaign differentiation because searchers in different parts of Canada behave differently. Session: Linking Campaigns and Beyond: Getting Authoritative Online "Mentions"
Visit www.searchenginestrategies.com for more information about this and future conferences.